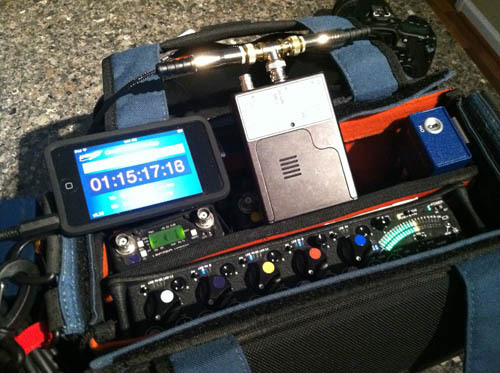 With my 552 it requires a source for its timecode, since it just time stamps the files. So I purchased a denecke sb-3 timecode box(it can jam to and from another device). 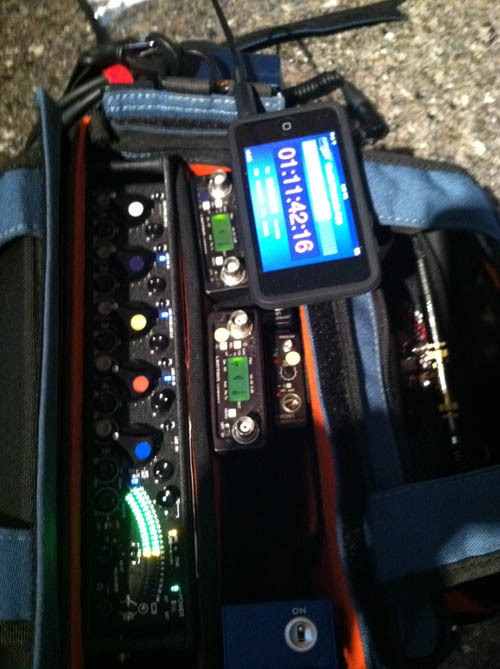 The sb-3 provides the timecode for my bag. I’ve got a splitter on it running to my 552 and then to my ipod touch. 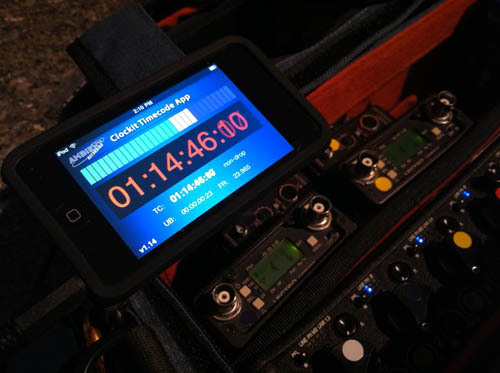 Using the ipod touch as my timecode display, I use the Ambient Clockit Timecode App, which is free in the app store. 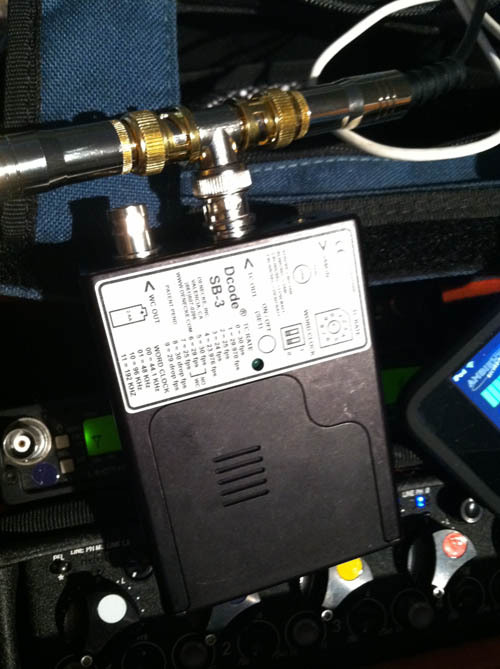 Its nothing fancy, just a timecode reader that displays the timecode, but a very valuable tool. 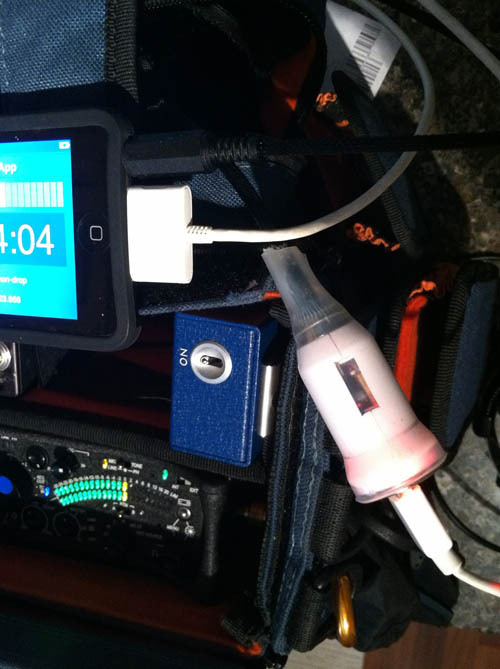 For the ipod to read the timecode it requires a a padded cable with a friendly 1/8″ cable from your timecode source(mine is bnc) and Trew Audio has the hookup on that. And you know I got that Angry Birds on there! Being as an ipod doesn’t have a battery that runs forever, my friends over and bluecow cables introduced a sweet little cable rig that runs from my bags BDS(battery distro) and has a usb female, thus allowing me to charge my idevice(gonna have to keep this a secret on set, otherwise I’ll get stuck charging everyone’s iphones…). Pretty handy cable I must say! You might be thinking, “well how does this help a DSLR shoot? Those cameras don’t have timecode?” Well, its as simple as when camera dude starts rolling he grabs a quick shot of the ipod. So that gives the video a reference of the audio’s timecode. As long as the camera op makes sure to grab a shot of the slate at some point during their limited 12 minutes, they’ll be good to go. Once all the footage is brought into final cut, its as simple as bringing the video up of the shot of the slate in the viewer, going to modify>timecode..> checking aux timecode 1 and entering the number on the screen, hitting OK and then selecting all of the clips that need syncing, right clicking and merging them by the aux timecode 1 and then BOOM! The clips are aligned and editing can begin. Editor loves you, assuming you got good audio…. I’m currently looking into getting a 552 and the TC setup has been bugging me for a while. This is exactly the info I was after, so thanks! I’m assuming for ‘proper’ camera work you can just ditch the sb-3, take the TC from the camera as it auto-start’s the recorder and it will still feed the ipod so you can double check the TC feed? That’s the setup I’ll mostly be using so wanted to double check. also, the sneaky iPhone charger is the first thing I’ll invest in, after the standard bag setup obviously!